The person who leased the house was Ralph Forbes, a “self-described” Nazi party captain, who proudly hung a portrait of Adolph Hitler over the fireplace, sold Nazi literature from his home, conducted meetings, and had an armed, brown-shirted storm trooper standing guard outside. Ralph Forbes inside his Glendale home. Forbes has a colorful history. A native of Michigan, he served in the U.S. Marines from 1957-1960. 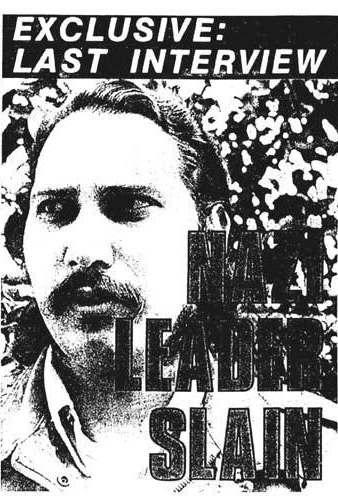 During those years, he became interested in Nazism but was careful about letting his political leanings known. 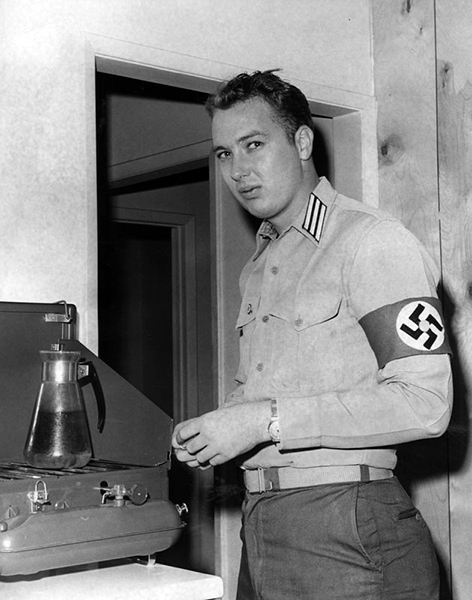 Following his discharge, he returned to Michigan and immediately became active in American Nazi Party politics, which led to a fall-out with his parents. In 1960, he befriended Rockwell, another ex-serviceman, who then sent him to Southern California in 1963 to unify party members there. Glendale city council members, embarrassed by an emerging Nazi presence, swung into action by refusing to turn on the electricity unless Forbes signed an affidavit swearing not use the house for Nazi gatherings. Forbes refused to comply and Nazi meetings were held by candlelight. At that time, Glendale’s local Nazi membership was estimated to be around 25 people with over a 100 more members occasionally driving in from the coastal towns near (and including) Long Beach. After the City of Glendale failed to get Forbes to sign an affidavit, property owner Dom Razzano filed a 30-day eviction notice, citing that Forbes had violated the lease by posting signage and for having armed guards on the property. He also tried to have the Nazis thrown out of the house, but Forbes’ political affiliation was protected by the Constitution. City attorneys next claimed that Forbes had violated municipal building codes. Charges were filed accusing him for converting a residential home into a business and for operating a “meeting hall” without city permits. Forbes, in turn, sued the City of Glendale for refusing to provide electricity. During the standoff, Forbes convinced party members to tone down the storm trooper uniforms by having them wear khaki. In 1964, he endorsed Barry Goldwater for U.S. President and Ronald Reagan for California Governor, though Forbes felt that both Republicans were too liberal. Hoping to move Republicans further to the right, he ordered Nazi members to discreetly infiltrate Republican groups. However, despite the party’s quiet infiltration of school yards and youth groups, Glendale’s Nazis made the news for their more overt actions. One member was arrested for engaging in a fight at the Rose Bowl. Another one provided a scare at Los Angeles’ City Hall by dowsing himself in what appeared to be gasoline while threatening to set himself on fire. The gasoline turned out to be water. Forbes, himself, was beaten up during an anti-civil rights demonstration in downtown Los Angeles. In January 1965, his pregnant wife (wearing a sign that read “I’ll have my child here where there is electricity!”) was arrested at Glendale’s City Hall for attempting to camp overnight with her two children. Eventually, electricity was restored to the house after Forbes agreed to pay commercial rates instead of residential ones. That spring, a jury found him guilty of violating sections of the municipal building code. 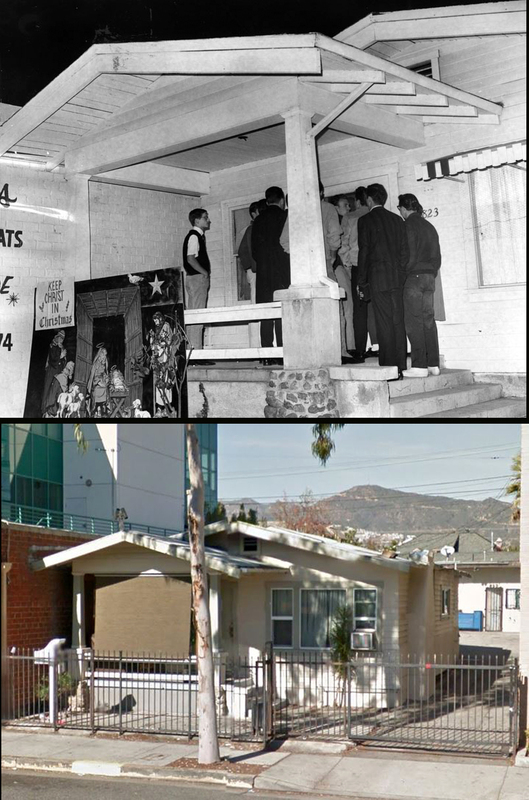 The verdict, however, was reversed in November of 1965 after the ACLU proved that the City of Glendale had singled out Forbes for persecution while ignoring other discriminatory organizations of doing the same thing. Mrs. Forbes outside her El Monte home. El Monte officials were horrified to have Forbes in their town, but there was little they could do to stop him as long as the party didn’t break any laws. The police, however, watched him closely. Around 1966-67, the local branch of the Ku Klux Klan, led by Reverend William Fowler, partnered with Forbes. The Klan then temporarily moved its headquarters inside the house. Forbes and Fowler worked together on a few money making enterprises, including the selling of white robes. Both men were later arrested for holding a Klan rally at Cajon Pass without a permit. Inside the El Monte Nazi Headquarters. The Klan eventually moved out of the house around the time Rockwell renamed his party “The National Socialists White People’s Party.” While Rockwell faced a backlash among his supporters, Forbes remained loyal to him. Forbes also continued to make the news, getting arrested for disturbing the peace at an anti-Vietnam rally on Wilshire Boulevard. Following Rockwell’s 1967 assassination by a disgruntled party member, Forbes left El Monte for Virginia in a failed attempt to succeed Rockwell as the party leader. 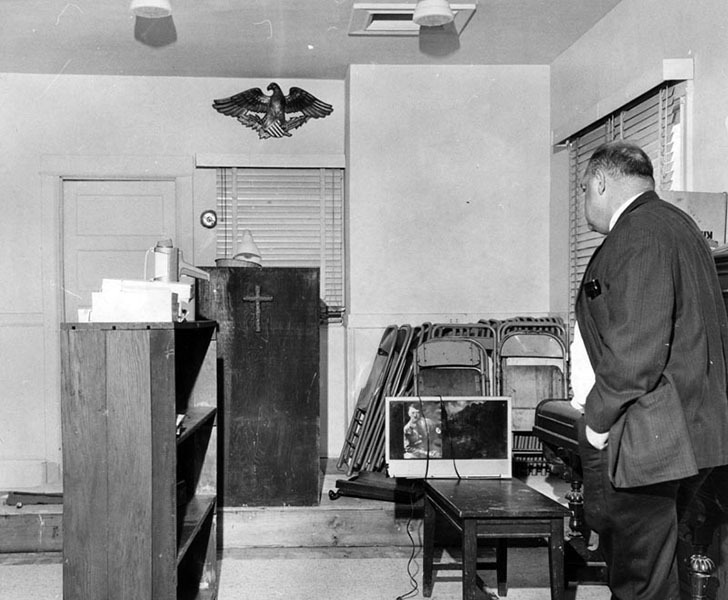 In his absence, Nazi member Allen Lee Vincent, from San Francisco, briefly took over the El Monte headquarters. One afternoon, Tommasi and an accomplice purchased items that could be wielded as clubs from an auto supply store. He and his companion then drove to the El Monte National Socialists headquarters. According to the Los Angeles Times, Tommasi jumped out of the car with his club in hand. Several National Socialist members, standing out front of the building, ordered him to leave. Threats ensued. As soon as Tommasi stepped forward with his club, an 18-year-old party member opened fire, shooting Tommasi near the right eye, killing him before he could approach the building. (Note: Another version of the story maintains that Tommasi was shot to death after flipping his middle finger to a guard as Tommasi drove past the building.) The killing made headlines. It also hurt the party’s ability to recruit. 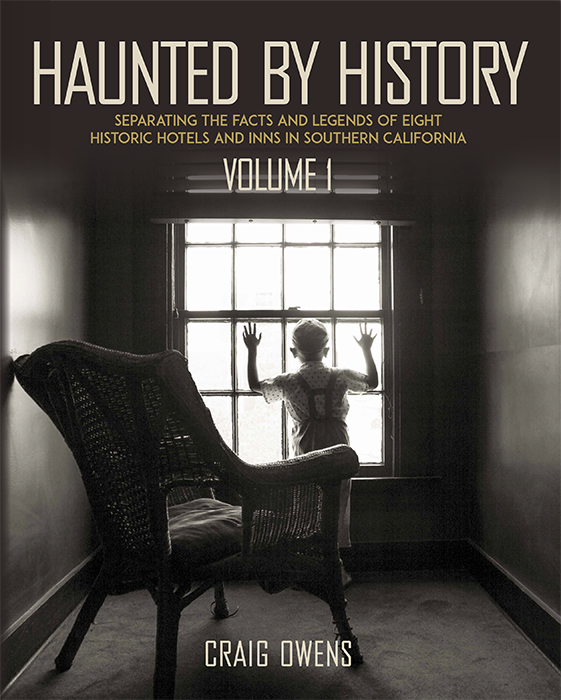 The following year, the Times announced that the party had placed their El Monte property up for sale and were planning to leave town. Once the property sold, the building was torn down. As I remember, there were several rocks thrown at the windows and an attempted fire. 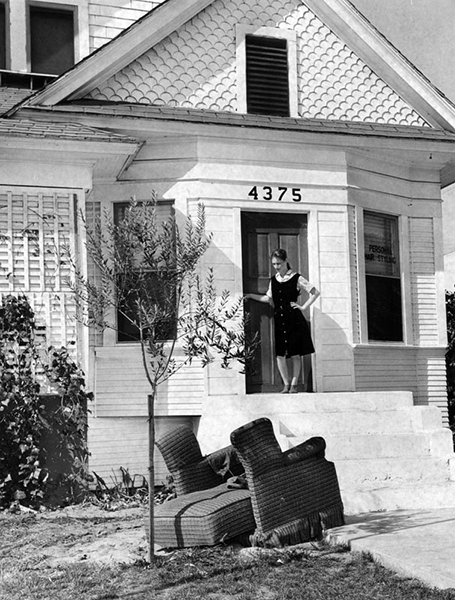 Most Glendale residents were appalled that the American Nazi party would choose Glendale as a headquarters, and there were several protests outside the house. Glendale had a great number of WWII veterans, and all hated nazism.